Doddington is a semi-hard, unpasteurised, cow’s milk cheese made by Maggie Maxwell at Doddington Dairy in Northumberland, just near to the Cheviot Hills. The area, with its low rainfall and sandy soil, is not known for its dairy farming but Maggie’s father and grandfather began farming the land in 1944, moving south of the border from Lockerbie. Maggie studied agricultural economics and food marketing at university before taking a cheese-making course and spending some quality cheese time in France and the Netherlands. She then returned to the UK, ready to embark on her vocation. Doddington was the first cheese she developed and it went on sale in 1993; it takes its name from the village in which the farm and dairy are situated. The business is a family affair, with one brother Bob looking after the cows and another, Neil, and his wife Jackie making ice-cream. A third brother, John, built their new milking parlour. The family have around 300 cows, a mixed herd of Friesians, Holsteins, Ayrshires and some Montbeliards (the cows traditionally milked to make Alpine cheeses like Emmental and Gruyère). They graze the pastures throughout the spring and summer, before being brought inside when things start to get a bit parky up north. They’re milked twice daily and the milk is brought still warm from the milking parlour to the dairy and poured into their round Dutch vat. Doddington was originally created to a Red Leicester recipe, where the curds are scalded, but Maggie has tweaked it over the years, including ‘cheddaring’ the curds (where they are stacked in blocks and turned to increase acidity levels and expel excess whey). 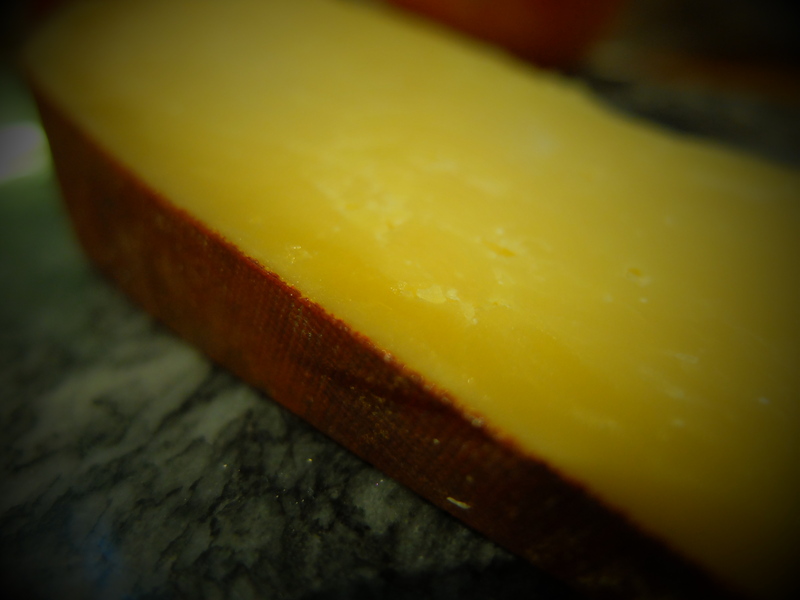 The cheese is covered in a brick-dust-coloured breathable wax (Dutch again) which ensures that nothing too furry grows on them whilst they are maturing on pine shelves. They are matured for a minimum of 10 months but up to two years. I love the look and texture of the rind and quite fancy getting some tiles for my toilet in the same style. The cheese smells sweet, a bit like a Gouda. The texture is quite dense, like a Cheddar but with a bit of a flaky-crumble to it (this is a technical term for ‘not crumbly like a Lancashire is crumbly, more sort of flaky’). The taste is also somewhat like a Gouda, sweet and nutty with hits of caramel but the texture is very different, much more like the territorials from which it springs. It’s a nice cheeseboard cheese but I bet it would melt very nicely in a toastie too. Son the older insisted on trying to eat the rind, despite me telling him it wasn’t edible; after several seconds of concerted chewing he confirmed this to be the case. Additional research from Farmers Guardian and The Journal. Sounds lovely. Like the combination of a Gouda flavour crossed with Cheddar and Lancashire – one I will seek out, thanks. Yum yum yum! This sounds like the best parts of both cheeses combined.